1. They add character. 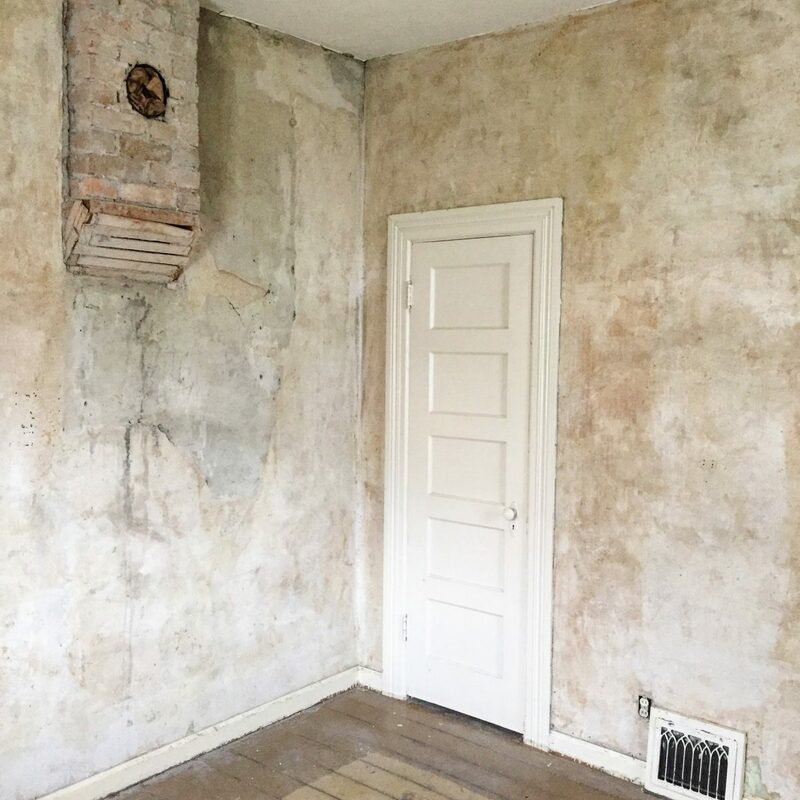 If we were to remove all the walls with their imperfect lumps and edges we would lose some of that character that attracted us to the old house in the first place. 2. 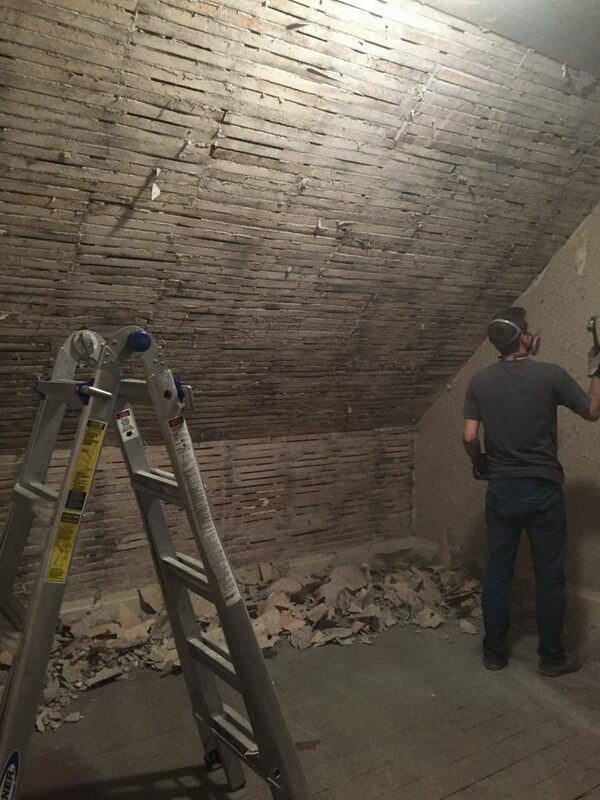 So much work is involved in removing lath and plaster. Plaster is HEAVY, dusty, and time consuming to remove. 3. We wanted to preserve the baseboards. I love the character of old baseboards! 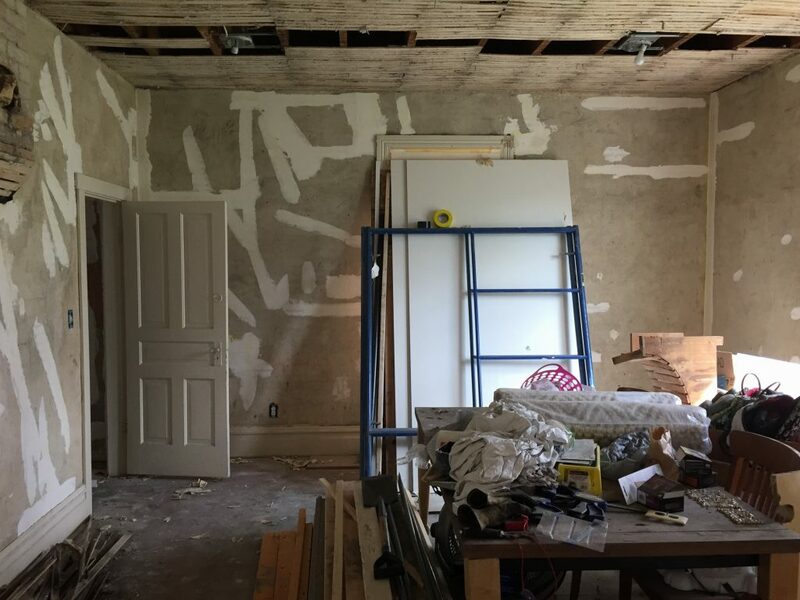 I feared that if we removed our baseboards (necessary if we were removing the lath and plaster), we would damage the them beyond repair or reuse. After we removed all our wallpaper (this took us about 2 months!) 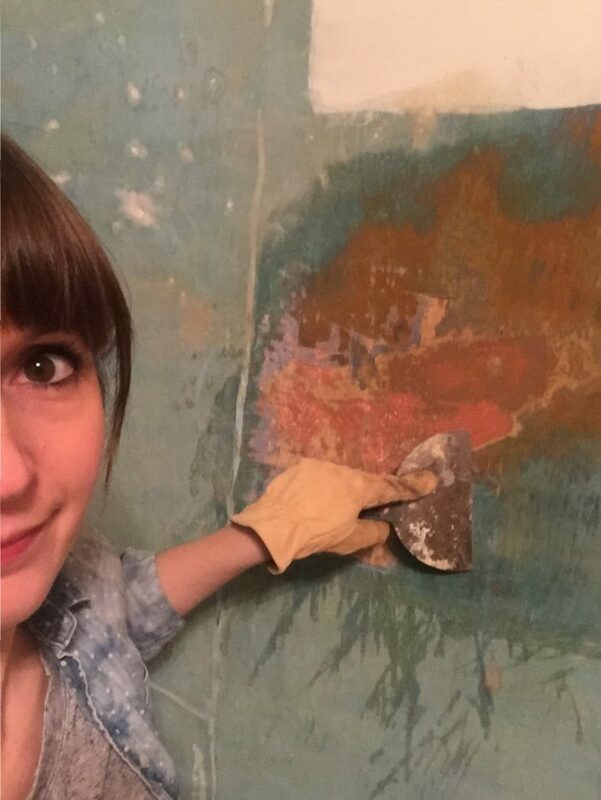 we realized that the plaster is too rough to simply prime and paint over. It felt like rough cement. If someone were to rub up against the wall they would likely scrape their skin and get a scab! 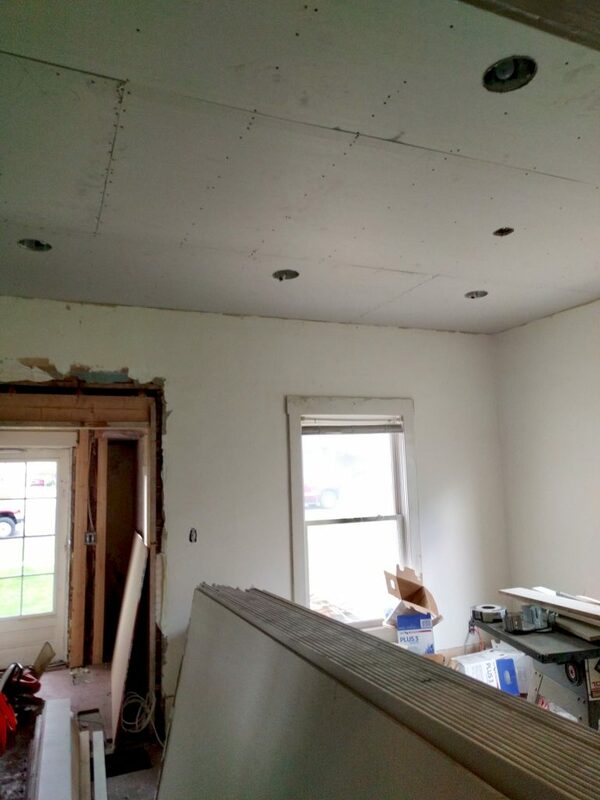 We also saw that there were some cracks throughout the walls that needed to be patched and we weren’t confident that we could blend the patches with the old plaster texture. We also realized that some of our walls had calcimine paint. I will devote another post to this topic, but the calcimine also complicated things. Calcimine cannot be primed or painted over as the paint will not adhere well and will eventually start to bubble and peel. Below I am removing the calcimine – a LONG process. 1. We are wanting to move in in a few weeks and knew that doing the job ourselves would delay us up to a month! 2. We have seen many DIY mud jobs that looked … well, not professionally done. We weren’t confident that we could get professional results with a Do-It-Yourself for this project. We spent about $400 in mud and tape supplies, plus the cost of the labor. You guys, it looks AMAZING! I absolutely LOVE how the walls and ceilings turned out. We chose a smooth texture instead of the orange peel or “holy smooth” texture. The ceilings we chose a standard “stamped” texture. I actually love the mud job so much, that I changed my mind on the paint color I was planning to use. The color of the dry mud is SO beautiful. It is a creamy white, not too yellow, not grey, just beautiful. I spent a good couple days bouncing back and forth from Lowe’s and our house buying samples to match the color of the mud. The color I found that matched it perfectly is Pam’s Silk by Valspar. COLOR OF THE SKIM COAT DRYWALL MUD – GORGEOUS! I have been practicing my paint spraying technique, and I have NO idea why I haven’t used a paint sprayer before. I primed ALL the trim and doors in one room in 4 MINUTES!!! No brush strokes, no dripping, just awesomeness. So over the next couple days I will be spraying on the paint, and my husband will be laying our flooring! EEK! Things are about to get real over at the Schmidt house! We couldn’t be more thrilled with how it is all coming together. 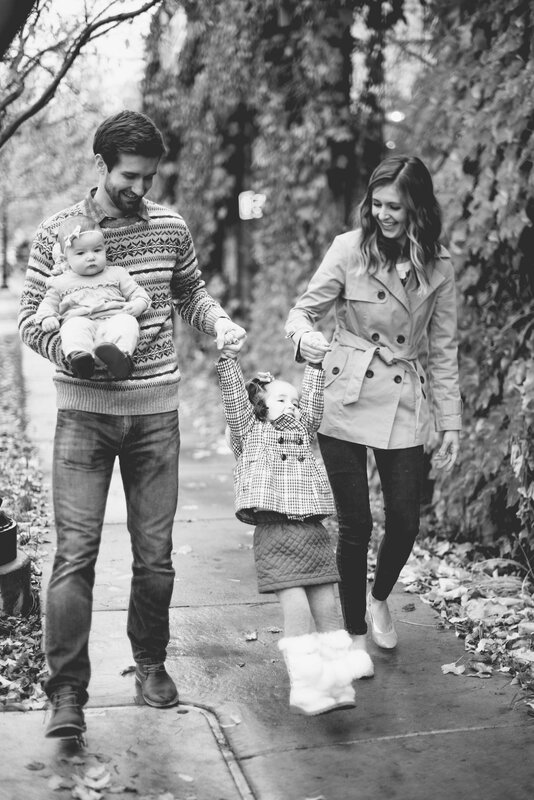 Thanks for following along with our journey! If this is your first time here, check out the previous posts of our renovation: phase 1, 2, 3, and 4. Be sure to check out my Instagram feed for more updates and progress pictures! 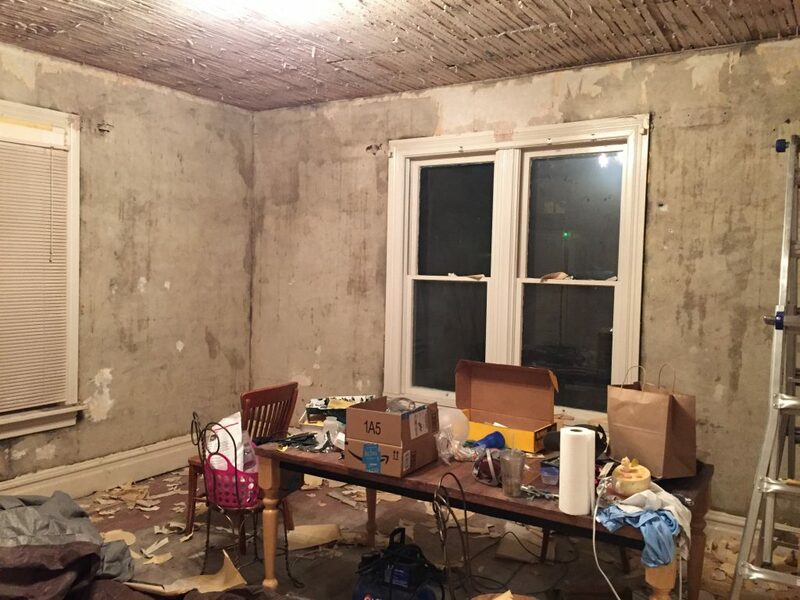 Your dream of restoring a 100 year old home is coming to fruition. What a gorgeous transformation! Love the color too!! Ahhh!! Megan it is looking so good!! I cannot wait to come visit you guys when it is all finished! We are hopping to be done in a couple of weeks too!! 😊 Love guns!! Where there’s a will, there’s a way. Great old saying. Congrats to you both on what will be a Priceless, Piece of History! 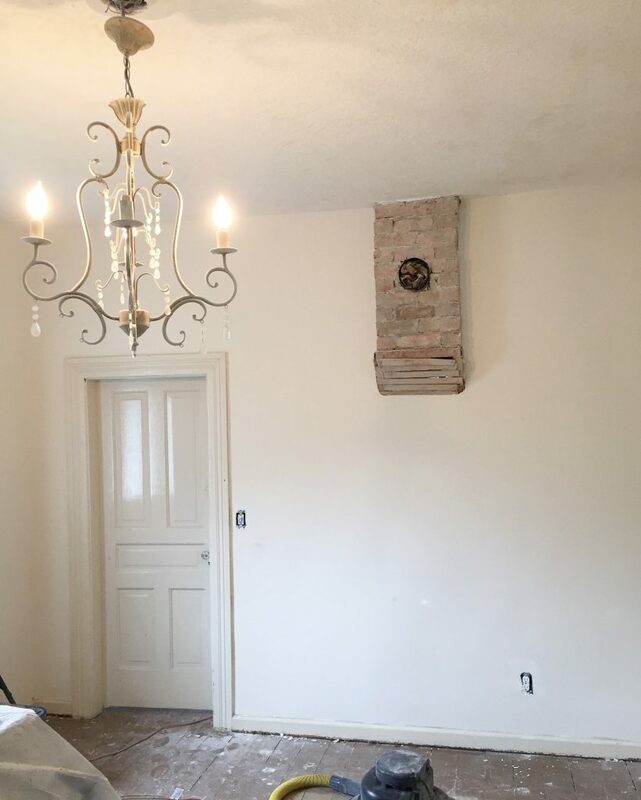 Could you put a floating bench in walls that have plaster? Yes absolutely! Just make sure you mount it in the studs. We use the magnet method to find studs in plaster. If you haven’t used a magnet to find studs before just google it really quick and you will see what I am talking about. Good luck! And I am so fortunate to live next door to a brilliant decorator! !